ins2outs / What roles are required for implementing the ISO/IEC 27001 Information Security Management System? If, as an Organization, you are considering implementation of the Information Security Management System (ISMS), you will be posed with the question which Roles/Functions are required to commence implementation of a system compliant with ISO/IEC 27001. The answer to this question is crucial for defining the catalogue of roles and the scope of their responsibilities in the Organization, as well as for preparing the ISMS contents in order to assign them to one or several roles. This procedure constitutes one stage of the information security certification process. The following figure presents the roles that are crucial, from my experience, for the implementation of an ISMS compliant with the ISO/IEC 27001 Information Security Management System and the Personal Data Protection Regulation. Drawing 1. ISO/IEC 27001 Main roles in Information Security Management System. Please note that, depending on the size of the Organization, a Role may be assigned to a single person, e.g. Information Security Officer, or to an entire group — the “IT Administrator” role is usually managed by a group/department responsible for IT support in the organization. This role represents an Employee/Contractor in your Organization. The competences and knowledge of persons assigned to this role are crucial for meeting the Organization’s goals with regard to data protection. They should work in accordance with applicable policies, processes, and procedures constituting the Information Security Management System. 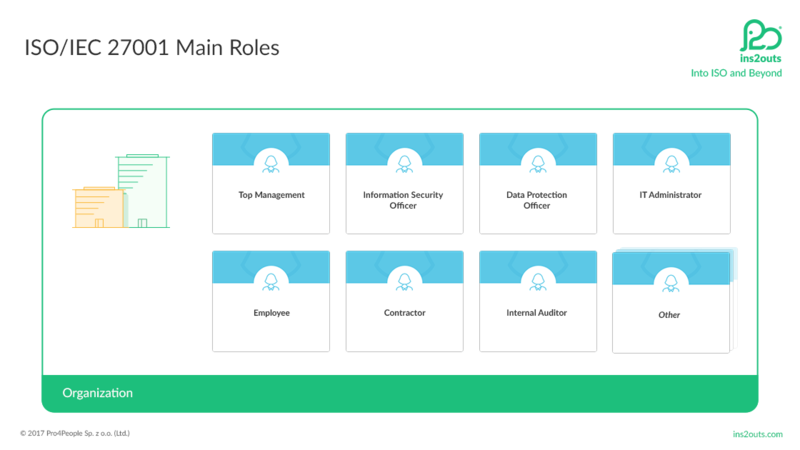 With regard to this Role, the Organization should focus on building awareness and competences in the area of data protection for existing and new employees. The Information Security Officer Role is responsible for coordinating all activities related to information security management in the Organization. In small- and medium-sized organizations, this Role may be assigned to a single person; in larger systems, it is advisable to assign a group of users to this Role. The person in this Role should have managerial, communication and technical skills. The IT Administrator Role is responsible for definition, implementation, and technical maintenance of security devices and technologies that constitute the Organization’s ICT networks and resources and the Information Security Management System. In small- and medium-sized organizations this Role may be assigned to several persons, and in large organizations — to IT departments. In the article on the implementation of ISO/IEC 27001 (“How to implement Information Security Management System”1 ), we pointed out that the support of Top Management is crucial for successful implementation of the Information Security Management System. The Top Management Role is assigned to a person or group of persons who manage and control the Organization at its highest level. In Poland, it may be for example the level of the Organization’s management board. The person in this Role, in the context of data protection, should be aware of his or her influence on the goals, strategy, and improvement of the Information Security Management System compliant with ISO/IEC 27001. The Internal Auditor Role is responsible for performing audits. An audit is a systematic, independent, and documented process of collecting audit evidence and its objective assessment in order to determine whether the audit criteria have been met and to what degree. The Internal Auditor Role is key in terms of the maintenance and optimization of the Information Security Management System. Smaller organizations should consider outsourcing this role to external companies specializing in such activities. The person in this Role should be able to combine the practice of auditing Information Security Management Systems with knowledge on the Organization and its security measures in terms of information security. The Data Protection Officer Role is not key in the Organization; however, due to the requirements set out in the Personal Data Protection Regulation2 , it is advisable to define this Role. In such case, this Role will be an extension of the Information Security Officer Role, based on the Personal Data Protection Regulation requirements. The scope of this Role is defined in the publication on the comparison of the requirements in ISO/IEC 27001 and in the Personal Data Protection Regulation. The ins2outs system significantly streamlines the implementation of the Information Security Management System compliant with ISO/IEC 27001 and the Personal Data Protection Regulation. In this way, the Organization will be able to quickly overcome the obstacle of lacking know-how on the Information Security Management System and then establish the ISMS to ensure that persons assigned to individual roles in the entire organization have the necessary knowledge and competences to support information security. This is a very important functionality for small, medium, and large organizations.